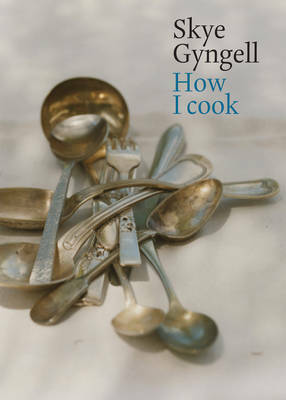 A few years ago, some friends gave me an Amazon gift certificate and I promptly bought the first cookbook on my wish list, A Year in My Kitchen by Skye Gyngell, which went on to be named Cookery Book of the Year by the Guild of Food Writers and the Best Food Book at Le Cordon Bleu World Food Media Awards in 2007. So when Quadrille Publishing offered me the opportunity to review her newest book, How I Cook, I jumped at the chance. The focus of How I Cook is on home cooking, albeit with “a little finesse,” as Skye says, which is reflected in the book’s content. There are no 30‐minute meals here, bur rather a sophisticated mix of everyday dishes and food for special occasions that is still achievable for home cooks. This book particularly appeals to me because of its format, which presents recipes as part of a complete menu (much like what we try to do on this blog). The book is divided into chapters — Breakfast, Sunday Lunch, Alfresco Eating, Afternoon Tea, Simple Weekday Dinner, Late Night Supper, Special Occasion and Time to Spare — and within those chapters are a series of ready‐made menus. This makes it an ideal book for entertaining or for leisurely weekend cooking when you have more time to potter in the kitchen and want to make something a little more special for dinner than the usual hastily thrown together midweek pasta dish. Skye is the head chef at Petersham Nurseries Café in Richmond, Surrey, and with fresh produce on her kitchen’s doorstep, it’s no surprise that her menus are strongly influenced by what’s in season. Skye brings together ingredients that are growing at the same time, since they often naturally complement each other. You can see this at work in combinations like the wintry Slow‐roasted Pork menu, which is made up of slow‐cooked belly of pork, a gratin of white beans, sauteed leeks and a fig tart. I’ve chosen the Peasant‐style Supper menu from the Simple Weekday Dinner chapter to feature here, but other recipes I’ve already bookmarked to try this winter include slow‐cooked shoulder of lamb with sweet paprika and chickpeas, oeufs en cocotte with spinach and Parma ham, spiced pears, and rice pudding with poached prunes. In the introduction, Skye says, “The greatest pleasure I derive from food is cooking for loved ones … I cook for the same reason that you do — to bring joy to others — it pleases me to see people smile and laugh and feel content around a table, and I’m sure it is the same for you.” (I know it’s true for Kelly and me.) If that sentiment strikes a chord with you, then it’s worth picking up this book. Skye points out that in a classic risotto, the warm stock is gradually added to the rice. Here, she has added only wine, cold and all in one go. This way, the rice takes on the flavor of the wine quite profoundly — which means it might not be suitable for young children; this might best be saved for a grown‐up dinner. Skye suggests serving cheese or seasonal fruit as dessert to round off this menu. Season the chicken joints well all over with salt and pepper. Place a large flameproof casserole over a medium heat and add the olive oil. Once the oil is sizzling, brown the chicken pieces in batches, skin side down, without turning, until they are golden brown; this will take about 5 minutes. Set aside. Pour off any excess fat, leaving a little in the casserole. Lower the heat, add the onion and sweat gently for about 10 minutes, until soft and translucent. Now add the garlic and crumble in the dried chili. Stir once or twice, then tip in the rice and toss it through. Increase the heat slightly, pour in the wine and return the chicken to the pot. Put the lid on, turn the heat to low and cook for 20 minutes. By this time the chicken should be cooked through and the rice will have a gentle bite. Tear the basil with your fingers and scatter over the chicken. Stir through, then taste and adjust the seasoning if necessary; it will almost certainly need more salt. Serve in warm soup plates, drizzled with extra virgin olive oil, and with the buttered spinach and glazed carrots on the side. Wash the spinach in several changes of cold water to remove all traces of dirt. Put the spinach into a medium saucepan with just the water clinging to the leaves after washing. Allow to wilt over a low heat, stirring from time to time. Once all the spinach has wilted, drain in a colander, pressing firmly with the back of a wooden spoon to remove excess water. Melt the butter in the pan, add the spinach and toss until it is really well coated. Season with salt, pepper and nutmeg to taste, then serve. If you can’t find small whole carrots, you could make these sauteed carrots instead, which uses much the same method. Scrub or peel the carrots and trim them, leaving on a little of the green leafy tops. Place in a saucepan with the butter and honey. Pour on enough cold water to just cover the carrots and add the thyme and a good pinch of salt. Bring just to the boil, then turn down the heat to a summer and cook until just tender; this will take about 10 minutes. Discard the thyme. Now turn up the heat and boil rapidly until all the water has evaporated and the carrots are coated in a lovely shiny glaze. Serve warm, with a generous sprinkling of chopped parsley.